Alexander Bopp is ready to battle Stermont's biggest monster yet -- the P-Rex! In this fifth book, Alexander stumbles into a VERY large footprint. And his friend Rip keeps finding candy in the street. What kind of monster leaves HUGE footprints behind? And where is all the candy coming from? Alexander, Rip, and Nikki must find out fast--before it's too late! This book is filled with humor, suspense, and zany black-and-white illustrations throughout! Troy Cummings has been drawing since he was a little kid. His illustrations have appeared in newspapers and magazines, on websites, on frozen-fish-stick packages, and in hospital waiting rooms. His picture books include THE EENSY WEENSY SPIDER FREAKS OUT!, MORE BEARS!, and GIDDY-UP, DADDY! 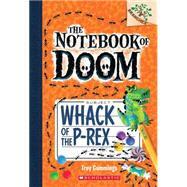 THE NOTEBOOK OF DOOM is his first early chapter book series. He lives in Indiana with his cat and family.